Pumping it up with Pompano! This is a great recent catch by Chad Wassink. He and his wife Anna went surf fishing in Orange Beach, Alabama. The Fishbites product they used was the E-Z Shrimp Saltwater in Orange. We have seen all types of colors and flavors catch great pompano, not just in Florida – this Alabama catch is proof! 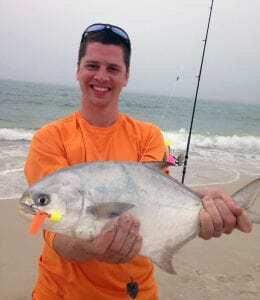 Below are some other recent Pompano catches using Fishbites, including the record Pompano caught in Vero Beach FL.